It starts with protecting the grass. 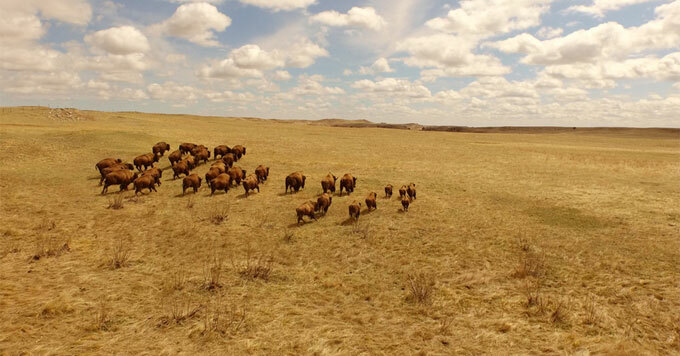 On South Dakota’s rolling hills, the grazing pastures of the 777 Bison Ranch are thick with native grasses. Ranch owner Mimi Hillenbrand’s family once kept both cattle and bison, but they found that the bison were hardier and better suited to life in South Dakota. So they switched to raising only the native livestock. They rotate the bison around their fields in a system that mimics the days when the animals roamed across the landscape. While grazing, the bison add manure to the soil – fertilizing it. But then they are moved to another field. The approach also helps the climate. Like thriving forests, healthy grasslands soak up carbon pollution. … but helping take care of the environment, too.